Princeton wildfire phots courtesy of Debbie Lyon. Jul. 9, 2017 8:30 a.m.
British Columbia’s political leaders were to meet Sunday with people forced out of their homes by wildfires that are threatening a number of communities in the province’s central interior. Premier-designate John Horgan was to meet with some of the evacuees in Kamloops, where he’ll also visit emergency operations centres that are dealing with what his team called the “worsening wildfire crisis”. Outgoing premier Christy Clark was also set to visit Kamloops. Ground and air crews are battling hundreds of out-of-control wildfires amid continuing hot, dry and often windy conditions that are making it a difficult struggle. There are 230 active wildfires burning across the province, said Kevin Skrepnek, chief information officer for the BC Wildfire Service. “It’s safe to say the majority of these fires are burning out of control,” he said. The hardest-hit regions are the central and southern Interior. There are also a number of major blazes burning in northern B.C. but at this point they’re not posing as immediate a threat as the fires further south, he said. A provincewide state of emergency was declared after more than 173 fires ignited Friday. The government said it would allow it to more easily coordinate a response to the crisis. Related: More than 180 wildfires burning across B.C. On Saturday, the winds eased slightly, but 98 new fires sprang up and existing fires grew in size, Skrepnek said. 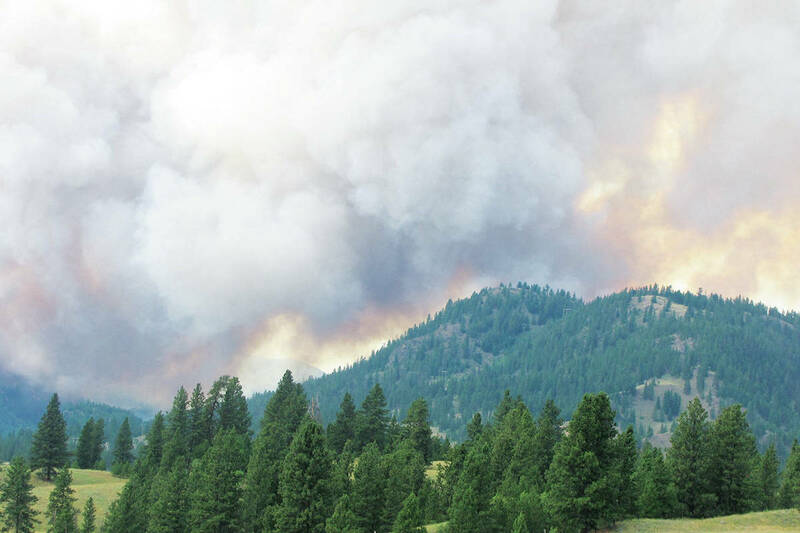 The three biggest fires range in size from approximately 14 to 20 square kilometres and have forced thousands of people from their homes in the communities of Ashcroft, Cache Creek, 100 Mile House, 105 Mile House, 108 Mile House, 150 Mile House and the Alexis Creek area. Precise evacuee numbers for the entire province were not immediately available Sunday, but the Cariboo Regional District estimated that as many as 6,000 people were forced from their residences. New evacuation orders affecting dozens of homes were issued on Sunday. The province has been marshalling all the personnel it can to battle the flames, protect property and try to keep people safe. More than 1,000 firefighters are on scene, supported by heavy equipment and helicopters. Another 600 personnel are backing them up, plus some 200 contractors. An additional 300 firefighters are being recruited from other parts of Canada and are expected to arrive in B.C. on Monday and Tuesday, Skrepnek said. Despite the crews’ efforts, Cache Creek Mayor John Ranta said a fire burning between Ashcroft and Cache Creek had destroyed dozens of buildings, including at least five houses, 30 trailer park homes and two hangars at a regional airport. “We have tremendous sympathy for the challenges we are all collectively facing,” Ranta said. Hundreds of people gathered in a conference room at Thompson Rivers University Saturday evening where an information session was held for wildfire evacuees. Cliff Chapman, the deputy manager at the Kamloops Fire Centre, suggested Saturday was a day he’d never forget. Ground and air crews are preparing for another day battling dozens of out-of-control wildfires that drove thousands of residents from their homes in British Columbia’s central Interior. The continuing hot, dry and often windy conditions are making it a desperate struggle, one that evacuees throughout the region are watching with increasing anxiety.